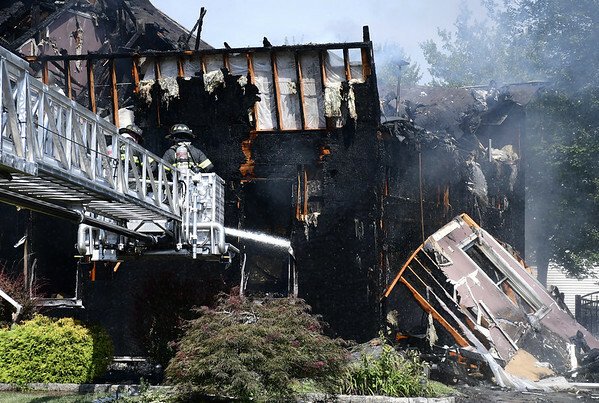 BRISTOL – Firefighters responded to a two-alarm fire Tuesday morning, near the Southington town line, where part of a home collapsed, leaving the four residents homeless. Firefighters were called to 366 Village St. at about 10:45 a.m., on the report of a structure fire where a vehicle was burning inside the garage. Upon arrival, crews encountered heavy flames and dark smoke coming from the windows and doors to the garage, according to Deputy Fire Chief John Ziogas. No one was in the home when firefighters arrived. No injuries were reported, but firefighters had to be evaluated by medics because of the high temperatures and humid conditions. The extreme heat caused them to become exhausted much quicker than normal, Fire Chief Jay Kolakoski said. Plainville and Southington firefighters were called for mutual aid due to the manpower needed, as a second alarm was activated. “Guys were going down quickly,” Ziogas said, adding that firefighters wear about 70 pounds of gear. Each person needed relief after about 15 minutes of battling the blaze, he said. The initial report firefighters received suggested someone may have been in the home, but they later found out that two adults, two children and a dog had safely gotten out of the two-story, single-family house. Fire crews entered the home through the front door to start fighting the fire, but after Ziogas began seeing signs of possible backdraft and flashover conditions, he called for everyone to evacuate. “The fire intensified,” Ziogas said, and smoke began to come from “every place” within in the home. Crews then battled the fire from outside for about half an hour before it was put out, using the ladder truck to attack the flames from above. At some point, the fire extended into an attic area, located on the floor above the attached garage, where the fire started. The attic area couldn’t handle the heat and collapsed onto the garage below. The American Red Cross was called to help the residents of the home find a place to stay, as the home was left uninhabitable and was condemned by the city. 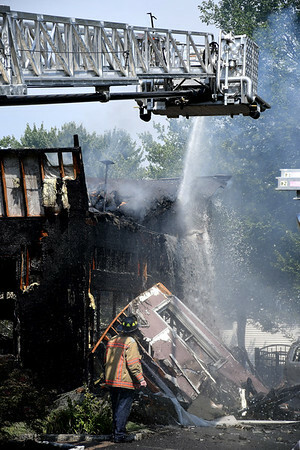 The garage area of the home was expected to be torn down Tuesday afternoon, with a determination about the rest of the house to be made later. Fire Marshal Robert Grimaldi is investigating the cause of the fire. 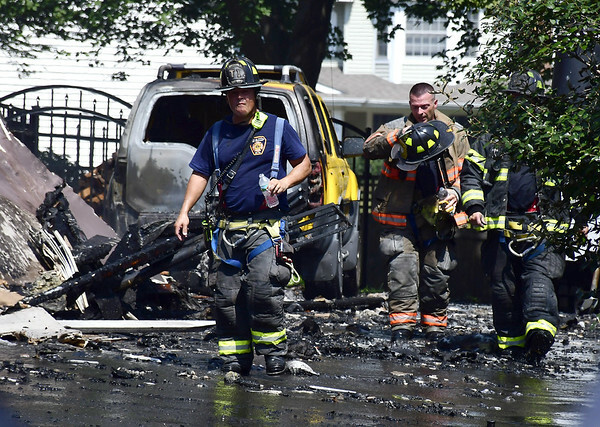 He said his crews are focusing on the garage, as a resident reported jumpstarting a vehicle in the garage before seeing sparks and ultimately flames. Grimaldi said the man told his family to get out of the home and unsuccessfully tried to put out the fire with a small extinguisher. Posted in New Britain Herald, General News, Southington Herald on Tuesday, 28 August 2018 20:15. Updated: Tuesday, 28 August 2018 20:18.